This article is 2549 days old. On Mothers Day, May 12th Premier Fitness will be hosting a fundraiser event to benefit the Canadian Breast Cancer Foundation, as part of their first annual Mother’s Day Boot Camp for The Cure. The local in-home personal training business will be holding the event at the Ford Test Track at 9am. Having helped numerous clients reach their health and fitness goals, Premier Fitness owner Sean Keats has set his own goal to raise $1,000 in the days leading up to the event. In addition to collecting loose change and collecting donations on the Premier Fitness website, Keats has some big plans. In the coming weeks, Keats will be donating 50% of all new client signups towards their goal. Keats explained that the event, on the 12th, is open to the public. Help support the cause by joining Sean Keats and the rest of Premier Fitness for the Mother’s Day Boot Camp for The Cure on May 12th at 9am at the Ford Test Track. 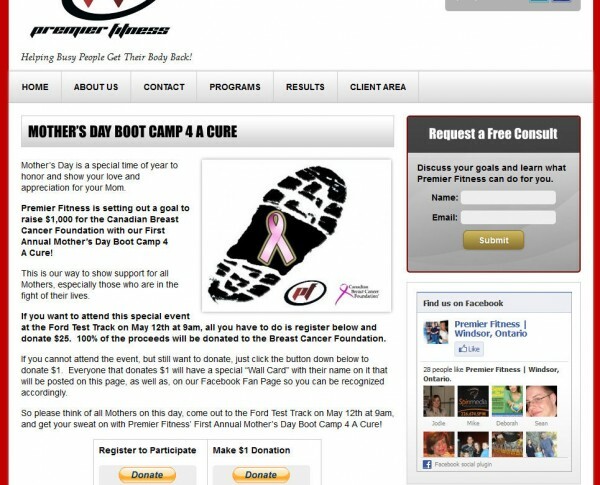 For full details regarding the Mother’s Day Boot Camp for The Cure click here.